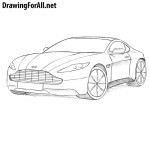 We love expensive and chic cars very much, we like drawing them very much and we very much like to teach you how to draw them. We have already created such luxury cars as Rolls Royce, Aston Martin and Bentley. And the current lesson on how to draw a Mercedes-Maybach will stand in line with these great cars. In no matter what car we draw, we need to start with the basic contours of the body. As in other lessons, we sketch the outlines of the Mercedes-Maybach body using almost invisible lines. Note that the car’s body must be long, since this car is an extended version of the Mercedes S-Class. Now we need to add the outlines of the most basic details on the body of our Mercedes-Maybach. 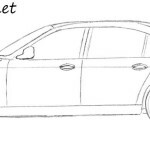 In the front we sketch the headlights, a bumper and a radiator grille. Next, sketch the contours of the mirrors and wheels. Note that the outlines should be smooth as in our example. In the previous steps we used very light lines. 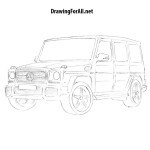 Starting with this step, we will use clear and dark lines to draw out our Mercedes-Maybach. With the help of such lines we draw the contours of the headlights and grille. Note that the front of this model is very similar to the front of the Mercedes S-Class. Now draw the contours of the hood (bonnet) with the help of long and smooth lines. Next, draw out the outlines of the bumper with the help of curved lines. Please note that this car has different bumper options. In the same step we will draw the famous Mercedes logo in the form of a three-beam star. Now go to the top of the car’s body and draw out the outlines of the roof using long smooth lines. In the step number five, we will draw out the outlines of windows and rear view mirrors. By the way, do not forget to delete the unnecessary lines that we drew in the first and second steps of this lesson. 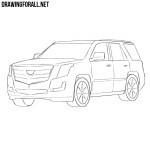 In this step we will finish drawing the outlines of the car’s body. Continuing the lines of the windows of our Mercedes draw out the outlines of the doors, the rear part and the bottom edges of the car. Now with the help of smooth lines draw out the wheels. Try to achieve the maximum roundness of the wheels. In the same step we draw wheel rims, which can be of any shape. In our example we draw fairly minimalist rims, but you can draw another shape, for example the one we drew in the lesson about a Mercedes SLC. The drawing lesson is almost complete, and we only need to add shadows to our Mercedes-Maybach drawing. To draw shadows, use dense and uniform shading. In addition to the shadows, we will draw glare with the help of long strokes. The actions taken in this step will make our Maybach more realistic. The drawing lesson about how to draw a Mercedes-Maybach was quite complex and long, but as always, we learned how to draw a very realistic car. By the way, now Maybach connected with the Mercedes S Class, and in one of the previous lessons we already drew a Mercedes S Class W221. And besides the S-Class on our site there is almost the entire modern model range of Mercedes-Benz. 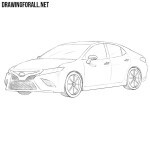 But if this lesson was too complicated for you, then visit our drawing articles about how to draw a car for kids and a very simple tutorial on how to draw a car for beginners.